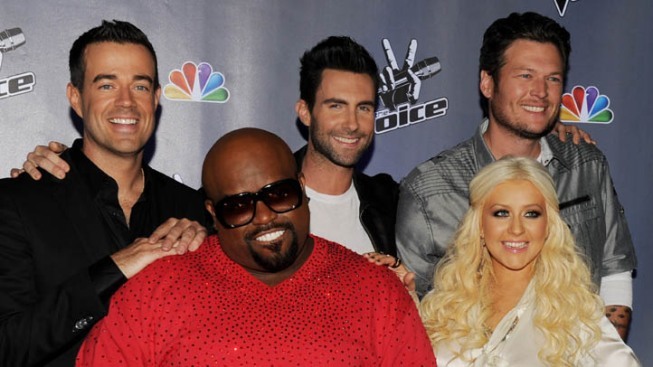 "Voice" coaches used extra caution during Monday night's blind auditions as their team rosters neared capacity. "We're definitely looking for the best," Cee Lo Green told the first man up who failed to make the cut despite a respectable rendition of The Black Keys' "Tighten Up." Coaches rarely gave singers instant gratification this week, forcing them to sweat through full performances before they'd hit the "like" button. The four coaches, who will train their 12-man teams to compete against each other in "battle phase," indicated they were looking for something unique. Tony Vincent, an ex-Broadway star who had roles in "Rent" and Green Day's "American Idiot" belted out a dramatic "We are the Champions," which was a bit too unique for all but Cee Lo Green, who told Vincent that Queen would be proud. Blake Shelton won an earthy street performer, Naia Kete, who wore long dreadlocks and an acoustic guitar, while Christina Aguilera grabbed Jonathas, a 23-year-old Brazilian-American whose Usher-esque performance had females in the audience leaping out of their chairs. Adam Levine won Mathai, a woman who had three judges fighting for her, leaving just two slots open on his team. Next week is the final night of blind auditions and expectations will certainly be high as coaches put the finishing touches on their groups before heading to battle.